EVENING GAZETTE, MONDAY, NOVEMBER 12, 1962. THE centuries-old Eagle and Child Inn at Weeton was badly damaged today when fire swept through the 60ft-long thatched roof. Twenty firemen and three engines from Wesham and St Annes fought the blaze. A fireman, Sub Officer John Haydock, aged 45, of Allandale, South Shore, from St Annes Fire Brigade, was taken to Victoria Hospital with an ankle injury after he fell 20ft on to a flat roof behind the inn. He was tackling the blaze from an aluminium ladder when part of a brick gable end collapsed and he dropped on to the flat roof. Other firemen carried him to safety. The outbreak was spotted by a woman passerby at about 10-45 a m. She shouted to Mr Edward Dunne, of Huyton, Liverpool, who was delivering beer from a lorry. mHe rushed in and shouted to the cellarman, who phoned the fire brigade. 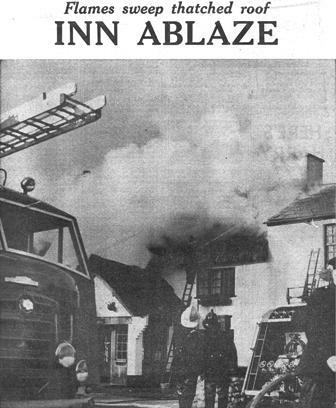 The landlord, Mr John Ridley, who had been out, returned ln hls van and began organising a chain of buckets of water to the roof-top blaze. 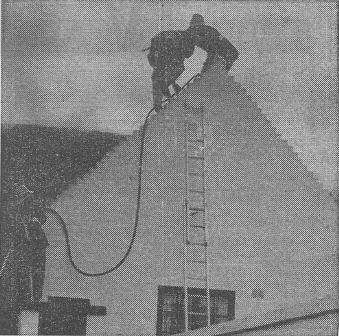 He clambered on to a flat roof behind the inn and threw the water on to the blazing thatch as the buckets were passed up by members of the staff. They were still tackling the outbreak when Wesham Fire Brigade arrived. The fire is believed to have started around a chimney on the north end of the inn. A flre brigade spokesman said that it looked as though it had been smouldering for some time as the thick attic beams were badly charred. Despite the efforts of the firemen, the fire quickly caught hold of other parts of the roof and at the height of the blaze some 30 to 40ft of lt was on flre. Clouds of smoke billowed across the village and the pall could be seen several miles away over the Fylde countryside. Mr Ridley, members of the staff and vlllagers ignored the flames and smoke to rescue furniture and clothing from the upstalrs rooms. A downstairs door had to be forced before big pieces of furniture could be salvaged by teams of helpers. Mattresses, bedding and clothing were passed out through upstairs windows and thrown into the arms of waiting helpers. Staff also carried to safety bar stocks and furnishings from the downstalrs bar and llving accommodation. 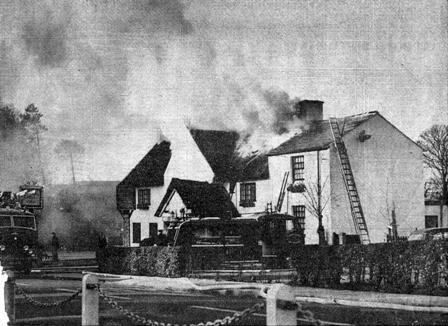 FIREMAN FALLS—Two firemen are seen on the gable-end before one of them, Sub Officer John Haydock, fell as brickwork gave way under him. 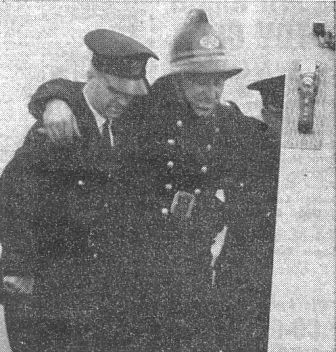 TO HOSPITAL.—Sub Officer Haydock is helped into the ambulance which was called for him after his fall.